The Motorola ATRIX 4G (AT&T) packs in a dual-core 1GHz processor from NVIDIA to give this smartphone almost computer-like capabilities. The Atrix 4G runs a full Mozilla Firefox 3.6 browser, not one of those stripped-down browsers we normally find on phones, and it can even be docked into a laptop-like chassis with a full QWERTY keyboard and 11.6-inch display used just like a laptop. The Motorola Laptop Dock has an incredibly thin design with an 11.6-inch screen, full keyboard, stereo speakers, and it's own battery that delivers up to eight hours of battery life. 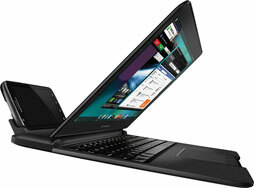 You simply dock your ATRIX 4G into the back of the Laptop Dock and you're up and going. The laptop dock is 2.4 pounds, which puts it in the range of a MacBook Air or small netbook—not bad for traveling. There is also a dedicated multimedia dock available with three USB ports and an HDMI port, so you can hook up a keyboard, mouse, speakers and monitor for working at your desk/office. Or you can connect the Atrix 4G to your television and use it's "Entertainment Center" feature to show photos, music and videos. Though most copy-protected content still can't be shown. The ATRIX 4G runs Android 2.2, 16GB of internal storage and a 32GB microSD card slot, front and rear-facing cameras, a 4-inch screen with a resolution of 540 x 960 pixels, and a powerful 1930 mAh battery to run it. What that all boils down to is this is one heck of a phone. I can't wait to get my hands on it for testing! 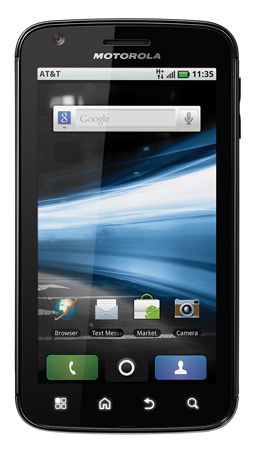 The Motorola ATRIX 4G will be available to AT&T customers in Q1 2011. Pricing has not yet been announced. “16GB of internal RAM”... do you mean 16GB internal memory and 1GB of RAM? because no phone can possibly have 16gb ram.. Thanks for the correction! It’s fixed. It’s simply amazing….I must have it. Great review, keep them coming! I don’t understand….....what’s the difference between fixed internal memory and RAM? The RAM is used by the phone’s operating system as temporary storage when loading and running programs and other system operations. The 16GB of internal storage is what is used to store program files, pictures, videos, etc. Think of “internal storage” as equivalent to your computer’s hard drive. The phone also has a microSD card slot which can support an additional 32GB of storage. WHEN will the ATRIX be available?? I am ready to upgrade and if it’s coming out soon…I’ll wait! Hard to say. All they’re saying is within the next 90 days. I like what they are trying to do with this device. I have been looking at buying a tablet to go with my Android phone but have not been able to really decide on one. This does everything that I wanted to do with my tablet and it incorporates the phone into the process. Adding a keyboard and mouse (touchpad) to the package seals the deal. Would love to see how this handles heavy java and flash web pages to see how much of the “Full Firefox Browser” is utilized. Only thing that makes me uneasy is the cost to take advantage of all its features. Suzanne, great write-up and video, thank you for posting. I got my Atrix the day it came out. I also got both the “PC” Dock and the media Dock. Both are great.